High on the bluffs above the Mississippi River, near the town of La Crescent, Minnesota, is Enchanted Meadows Organic Dairy Farm. This enterprise is owned by Art and Jean Thicke, and has been in the Thicke family for over 85 years. The conversion to organic was completed in 2005, and they became members of Westby Cooperative Creamery in 2008. Chad and Melissa Crowley, and family, help operate the farm on a partnerships basis with Art and Jean; and three years ago (2013), the Crowley’s purchased an ownership position. Daily operations include animal care for 90 Ayrshire milking cows, and 28 bred heifers and 28 heifer calves; plus, the management and working of 230 acres of cropland. Much of this cropland is pasture, needed to help feed the cows in a rotational grazing program; moving from pasture to pasture over seven months of the year. This natural environment of pasture grasses includes a mixture of timothy, meadow fescue, red and white clover, blue grass, brome, and orchard grass. The cows are rotated from pasture to pasture, allowing time for the grasses to regrow; which can take from 25-to-50 days, depending on rainfall and sunshine and time of year. It is sunshine that helps to produce the grasses and other crops on this farm, through the process of photosynthesis. This is the means by which plants convert sunlight into energy for growth. And, it is the sun that is now being harnessed to produce a new crop on this farm. This new crop is electricity; which is produced through the process of photovoltaic systems, commonly known as solar cells, that convert sunlight directly into electricity. The simplest form of solar cells are used to power small electronic calculators. “Energy efficiency has been one of our objectives for years; since electricity costs are always rising,” Art says. “We have installed LED lighting in our house and farm buildings, and we’ve been studying solar and other renewable energy producing technologies for some time. From the research and number crunching that I’ve done, it was clear that solar was the ideal technology. The solar electric systems on Enchanted Meadows were designed and installed by Paul Kreidermacher, founder/owner of MinnSolar, LLC. Paul is an electrical engineer. He grew up on a now organic farm west of Winona, Minnesota. The total project actually includes two solar electric systems. At one location a 40 kilowatt system powers all of the needs of the dairy farm, and Thicke house. A second 20 kilowatt system provides electrical power at the nearby Crowley house, and the heifer barn at that location. Each system includes ground mounted arrays of solar panels positioned south-facing. The panels are fixed at a 35-degree slope angle for maximum exposure to the sun, and easy run-off of rain or melting snow. The 40 kilowatt system at the Thicke location is comprised of four arrays. Each array consists of a top and bottom row of panels, with from 14 to 16 panels in each row. Each individual solar panel measures approximately 3-feet-by-6.5-feet in size. There are three arrays of 32 solar panels, and one array of 28 panels; for a total of 124 solar panels. The 20 kilowatt system at the Crowley location consists of two arrays, with 32 solar panels on each array. All of the solar panels and equipment installed are of the highest efficiency and quality on the market. An informational seminar was conducted in late June (2016) at Enchanted Meadows; hosted by the Thicke’s and Crowley’s, and presented by Paul Kreidermacher, for other members of Westby Cooperative Creamery. 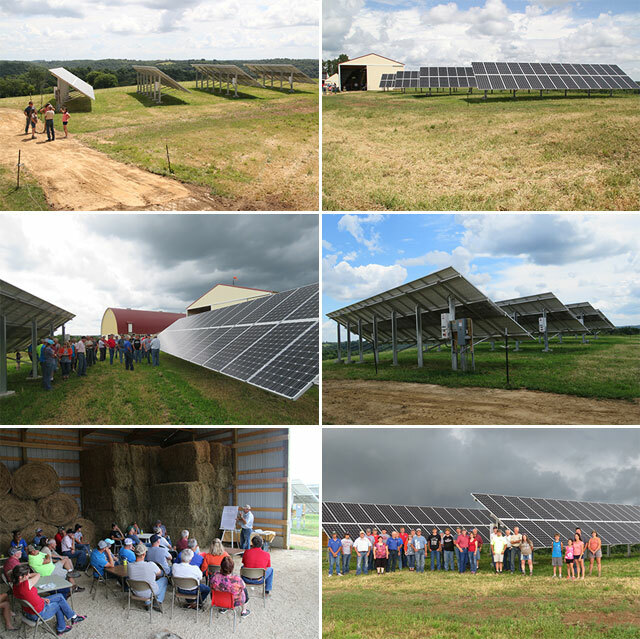 According to Paul, there are financial incentives and clear benefits for farms, especially dairy farms, to consider the installation of a solar power electric system. “Some incentives will vary at the state level; but, at the federal level, there is currently a 30% federal tax credit and a 5-year depreciation schedule for solar systems. And, an application can be submitted for a USDA Rural Energy for America Program (REAP) Grant that, if awarded, will cover up to 25% of a project’s cost, which we got for this project,” he says. “These incentives were definitely part of our final decision making process,” says Art. “More so, was knowing that we could become energy self-sufficient. The power created by these solar systems cover all of the electric needs for the houses and farm buildings at both locations, reducing our carbon footprint and improving the overall sustainability of our farm. “And, at certain times of the year, will put additional power onto the electric grid for others to utilize. Meters record the amount of electricity produced, used on location, and transferred to the electric power grid. We have all of the data and information needed to justify the investment, and to track the return on that investment for years to come,” Art states. As sunrise and sunset mark the passage of time; so, too, do they mark the renewable power of solar electric systems. The future is bright for more of these systems to be installed on farms across America, where sunshine will produce crops and electricity. This article was republished from the original by Westby Creamery.